As the Trump 0 of the Major Arcana, the Fool represents the hero (or querent) setting off on his or her journey, ready to take on the world. 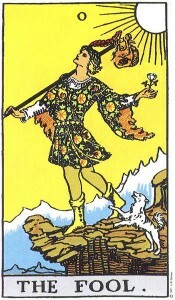 With very much the message of “jump, and the net will appear”, many depictions of this card show the Fool stepping off a cliff. Accordingly, this card is about taking risks and embarking on a new adventure, facing the future with hope and a sense of possibility. 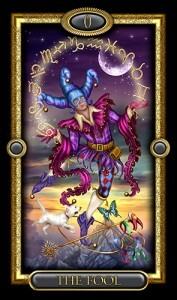 It can sometimes imply a reckless youth who is too open-minded or trusting for his/her own good, but most often it is a card of good fortune and a positive future. In a reading, this card guides you to take the risk you’ve been contemplating with a sense of optimism and faith. Drawing the Fool is the ultimate green light for you to begin a new adventure.